This email recently showed up in my inbox. Take a gander at the subject line. As a self-employed person, I depend on paid invoices. Without them, I couldn’t pay my bills. 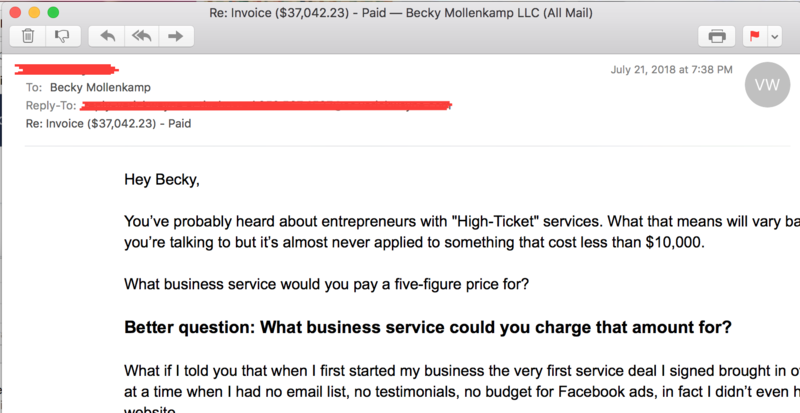 So, I tend to notice words like invoice and paid in my inbox. Throw in a re: and my brain instantly assumes it’s a real email reply that needs quick attention. Of course, it’s not. It’s sales email sent en masse to everyone on this person’s email list. In fact, this is becoming a common trick. I’ve seen more of these subject lines in my inbox lately. This one was simply the straw that broke this camel’s back. Marketers do things like this because it works. The open rate for this email was probably sky high. I can only hope the unsubscribe rate was also through the roof, but I’m sure he was willing to take that risk. Fool enough people into opening the email, and you’ll likely also get a decent number to sign up for a free masterclass on how to make big bucks. Sure, it works. Guess what else works? Stealing. You can pocket a candy bar at a grocery store and probably get away with it. Does that make it okay? Do the ends justify the means? Not in my book. 1. Don’t fall for this marketing craze. Don’t open or buy from these types of emails. It only feeds the beast and gets more people using the tactic. Also, if some marketing guru tells you to this, think long and hard about whether it aligns with your values. Is this how you want to show up in the world? 2. I’m making a pledge to you. I promise that I won’t do this to you. If ever you get a re: from me, it’s because I’m actually replying to an email you sent me. If ever you see an “invoice paid” from me, it’s because I’m sending you actual money. I will always do what’s right, even if it means a smaller open rate and fewer sales. If you love (and use) these types of subject lines, that’s fine. Every entrepreneur has the right to conduct their business how they choose. But, we’re of two different schools of thought about business, and I’m probably not the type of business coach you want to follow. No hard feelings, for real. To everyone else, thank you for not sending me emails like this. Thank you for delivering a service or product that’s so good it doesn’t require tricks to sell. Thank you for providing value and for keeping it real. Being a guest on podcasts can be great for your small business. It can help you build brand awareness and (depending on the show) may even allow you to pitch your services or product. If you target the right podcast, you can get your name in front of your ideal customer and have them pay much closer attention than they would to any ad you might buy. There are plenty of guides out there to help you determine which podcasts to pitch, and how exactly to market yourself to the hosts as a potential guest. If you’ve followed those tutorials and lined up some podcast appearances, that’s great news. But it may also be a bit terrifying if you’re new to being interviewed. You may be worried about sounding like a blubbering idiot. Fear not. As a journalist who has conducted thousands of interviews, I’ve learned a lot about how to talk to the media (or, in this case, a podcast host). Oh, and now that I host a podcast of my own, I’ve really learned what makes a guest great. 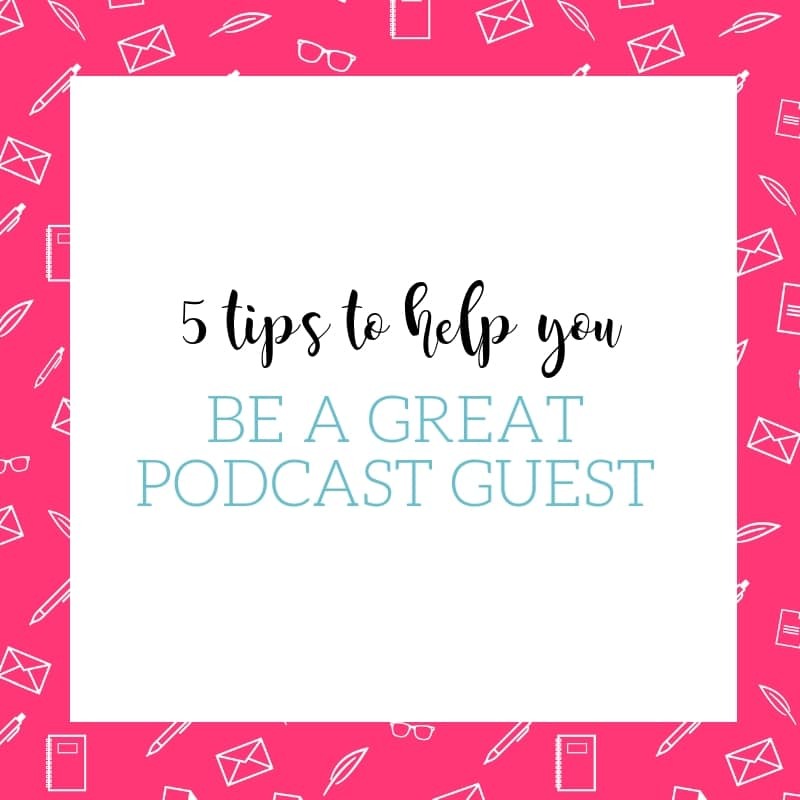 Here are five things to do to make sure you’ll be a memorable (for all the right reasons) podcast guest. Do your research on the show and its hosts well in advance of your appearance. What’s the format? What types of questions do they tend to ask? Do they like you to use a lot of real-life examples? Do they like stories or do they prefer a focus on takeaway tips? How long is the show? How much self-promotion do they allow? Knowing all of this in advance will help you prepare and organize your thoughts so you don’t trip over your words. Use what you learn to create talking points that you can keep nearby during the interview in case you suddenly lose your train of thought. Choose a few points you want to make, and come up with answers to the types of questions you’re sure to be asked (if the hosts give you questions in advance, even better). Again, write these down on a cheat sheet that you can turn to during the interview if you feel lost. In advance of your appearance, consider doing a few Facebook lives (or, if you’re camera shy, record yourself on your phone or computer without an audience). This can help you get more comfortable talking on cue, and also gives you the opportunity to go over your talking points several times so you know them well. The point isn’t to memorize, but you do want to be so well-versed in your content that you can speak off the cuff about it confidently without fumbling. If you’re being recorded via phone, do the interview in a place where you have reliable service and reception. If the show is recorded using an online platform (Skype, Google Hangouts, Zoom), make sure you have a stable Internet connection. You don’t have to buy a fancy microphone, but make sure you have headphones with a built-in microphone. Also, don’t allow the mic to rub your hair, clothing, or jewelry during the recording (this creates a very distracting sound). Find a quiet room that doesn’t echo to do the interview (pro tip: closets are usually great for this). Also, ask in advance whether you’ll be on camera. If so, think about where you’ll film. Choose a space where you have light in front of you, not behind you. Choose a background that isn’t too busy and distracting. Wear a simple shirt, do your hair and makeup, and check yourself on Skype or Google Hangouts to make sure you’re happy with how it looks before you film. Everyone tends to talk a lot faster than they realize, and it gets even worse when nervous. When we talk too quickly, we’re more likely to stumble over our words and use filler words like umm and uh. Make a conscious effort to slow down during your interview. Remember to breathe and talk very purposefully. You’ll be much happier with the results when you listen back to your appearance later. If you think you’re talking too fast, you definitely are. If you think you’re talking too slow, you’re probably doing well. After the interview, email the hosts to thank them for having you on the show. Also, send along social media handles, photos, or anything else they requested (or anything you may have referenced during the show, such as links to a course or opt-in). Finally, don’t forget to ask when your episode will air and if they’ll be sending you anything to help promote the show. If they do send graphics and copy, be sure to do your part to promote the show when it airs. A killer podcast appearance can have myriad benefits for your business. A little advance prep and following these five strategies can help ensure you get your guest spot right. Building a sustainable, profitable business as a self-employed business creative isn’t an easy task, and I’m incredibly proud my writing business has made it to year 13. When people ask me the key to my success, they’re surprised when I say LinkedIn. Yep—the stuffy, boring site that most people don’t even think about is directly responsible for half my income year after year. Two of my largest clients found me through LinkedIn (not the other way around) and they alone accounted for $40,000 of income last year. And I recently signed another new client who found me through LinkedIn for a monthly retainer of nearly $2,000. That’s what I love about LinkedIn. The companies there tend to have bigger budgets and are more open to repeat or retainer work—and those are important factors when you’re looking to create a stable business. Before you write the site off completely, however, review this list of the five LinkedIn mistakes I see most small business owners make. Maybe LinkedIn isn’t working for you because you’re not using it to its full potential—yet. With 500 million users on LinkedIn, chances are good you’ve set up a profile there. You probably set it up back when you left your 9-to-5 to pursue self-employment or maybe as you left college a few years ago. And you haven’t really looked at it since then. Many people think LinkedIn is a static site with no real engagement. They believe it’s a site only used by employers and recruiters who are searching for candidates for full-time positions. With this in mind, they simply use LinkedIn as an online resume, and only visit it when they have something new to add to their credentials. No matter your business, LinkedIn offers benefits beyond lead generation. The site can help any business owner with networking. You can use it to find potential partners and collaborators, as well as service providers for everything from payroll to pest control. It’s also an amazing educational tool. Between joining industry-related groups to reading articles posted by experts, you can use the site to stay on top of everything you need to know about running a business in general or advancing in your particular industry. Best of all, you won’t get sucked down the rabbit hole that is Facebook. If you’re still treating LinkedIn like an digital resume, it’s time to make big changes. You need to optimize your bio so you can get found, create and share content to establish yourself as an expert, and use search and groups to create and sustain meaningful connections. You may think LinkedIn is a waste of time, but the facts argue otherwise. On the whole, LinkedIn redirects four times as many users to company home pages as Facebook and Twitter. It also generates the highest visitor-to-lead conversion rate (2.74 %), about three times that of Facebook and Twitter. Going into any networking or marketing effort without a plan is a recipe for failure. When you approach LinkedIn haphazardly, with no intentionality behind your efforts, you’re unlikely to yield great results. It’s easy to blame the platform, but lack of planning may really be at fault. To make the most of LinkedIn, devise a strategy. Think about the types of people using LinkedIn and which of those could be your ideal client. This may vary from the types of customers you’re courting on other social media or through your blog. How would these people find you? What words would they search to find your services? What are their pain points? How would you speak to them to address their specific problems? Write all of this information down and use it to craft a keyword strategy. This will inform how you write your profile as well as the type of content you share on LinkedIn. There are two really key pieces of real estate on LinkedIn, and most people don’t give them much thought. That’s a big mistake. The most important part of your LinkedIn profile is the headline. That’s the line under your name and photo, which comes before everything else in your profile. That headline is what appears when your name shows up in search results. About 90% of people use owner and their company name or what they do (writer, photographer, graphic designer). That doesn’t really say much, and it certainly doesn’t set you apart from the thousands of other people who do what you do. Instead of just listing what you do, take it a step further and explain how you help your ideal customer. That simple tweak will put you leaps and bounds ahead of your competition. The other prime real estate in every profile is the summary. When someone comes to your profile, one of the first things they see is the summary (it’s the area below your photo and headline). If it doesn’t grab them, they leave without ever seeing all the information below about your experience and education. If you’re counting on your credentials to win over prospects on LinkedIn, you better make sure they stick around long enough to see them. Unfortunately, a lot of people use maybe 20 to 50 words here. What a missed opportunity! One of the best ways to make your LinkedIn presence dynamic and interactive is by sharing content via status updates and original articles. Most solopreneurs skip this step entirely, while others don’t properly target their messages. Both are mistakes. Content on LinkedIn starts with having a strategy (see #2 above). If you don’t have a goal for LinkedIn and don’t know who you’re talking to on the site, then cutting and pasting status updates from other social sites or reusing your blog articles might seem logical. People think of LinkedIn as a boring, buttoned-up site—and maybe it is. The upside, however, is it’s devoid of politics, dating, and silly cat videos. When people are on LinkedIn, they’re ready to conduct business. If your content isn’t what they want to hear when they’re in business mode, it won’t work. Start sharing content on LinkedIn, and be sure to choose topics and use language that’s appropriate for the audience you’re addressing. There are a lot of mistakes people make when it comes to LinkedIn connections. First, they don’t make connections. The most successful users of LinkedIn are those for whom adding connections on the site is a knee-jerk reaction. They meet someone professionally and immediately add that person as a connection on LinkedIn. The size of your network on LinkedIn directly affects your visibility on the site. So, if you want to up your chances of being found by new prospects, you need to constantly add new connections. Second, most people don’t personalize connection requests. It’s easy (aka lazy) to hit “connect” and let LinkedIn automatically send a generic request to the other person. Failing to personalize a request tells the other person you didn’t care enough to write them a message. Not asking something about them and sharing a bit about you also misses out on an opportunity to start a conversation, which could potentially create a client. Third, users don’t reach out to the people who connect with them. We assume that anyone who sends us a connection request already knows us, so we don’t need to reach out to them to ask what they do and how we can help their business. Oh no! Those people are your warmest leads on LinkedIn. They have expressly said they want to get to know you. If they failed to personalize their request and strike up a conversation, it’s incumbent upon you to do it if you want to take the relationship to the next level and turn it into new business. If you’re ready to really up your LinkedIn game, sign up for my online LinkedIn for Small Business course. I go over everything a small business owner needs to know to go from feeling lost about LinkedIn to getting found on LinkedIn. Word-of-mouth advertising is the most effective and affordable way to get new business (92% of consumers believe a recommendation from a friend or family over any other type of advertising). Here are a few ways to get people talking about your business and sending new clients your way. Make your customer service so memorable that people are compelled to tell others (for example, send handwritten thank-you notes or give small gifts on clients’ birthdays). Add a line at the end of your e-newsletters encouraging readers to forward to their friends. Create a referral program to motivate customers to send new business your way. Create a company page on LinkedIn and share valuable content your target audience will want to read and share. Send press releases about your company’s newest products or latest achievements to trade magazines. If you’re quoted or featured in a news story, share it on your website, push it out on social media, and include it in your e-newsletter. Attend industry events to build your network of referral partners. Make sure you spend time talking to people and learning about their businesses; networking is a two-way street. Speak at conferences, networking events, or even the local library. Hand out business cards and encourage attendees to share your contact information with anyone who may need your services. Ask current customers for testimonials you can add to your website. Refer business you can’t handle (whether you’re too busy or it falls outside of your scope) to other businesses, and they’ll be more likely to return the favor. Run a highly targeted Facebook ad focused on influencers in your niche. Join LinkedIn, Facebook, and Google+ groups where your customers spend time. Contribute to the conversations and provide helpful information (not promotional content). You’ve likely heard about content marketing, and you may even believe it’s important. What you may not like to admit to anyone, however, is that you really have only a vague understanding of what it is or how it can help your business-to-business (B2B) company. Don’t worry. No one ever has to know you read this post to get the inside scoop. Traditional advertising (think billboards and TV ads) sends your message out into the world. That’s why it’s also called outbound marketing. It can create an immediate big splash, but also costs a lot of money and may fall on deaf ears. Content marketing, on the other hand, is the process of creating information that will attract prospects and customers to your website. That’s why it’s also called inbound marketing. Content marketing includes things like blogs, videos, slideshows, infographics, ebooks, whitepapers, case studies, and webinars or other presentations. It’s a long-term strategy that costs less than traditional ads and is more targeted, but it can take months to deliver sizable financial results. More than 200 million people worldwide have installed ad-blocking software. That makes traditional marketing pretty ineffective. While content marketing costs 62% less than outbound marketing, it generates 3 times more leads. 94% of B2B buyers conduct online research before buying. Companies with an active blog get 97% more leads. B2B companies that blogged 11+ times per month had almost 3 times more traffic than those blogging 0-1 times per month. Attract online visitors using social media, blog posts, and search engine optimization. Capture leads with calls to action (capturing emails by offering free opt-in content). Create sales by emailing leads additional content and promotional materials. Turn customers into advocates with rewards programs. A blog that is consistently updated with new posts, and photos or graphics. Search-engine optimization (SEO) techniques to increase the visibility of blog posts and other online content. Social media participation in the channels used most frequently by your customer base (for people in creative fields, for example, Pinterest and Instagram may be most powerful; more technical businesses may find LinkedIn and Twitter most influential). Bonus materials for visitors who opt-in to your email list. An email list. Seriously, it’s impossible to understate the importance of having an email list. Regular email campaigns that offer great value. Starting and running a successful content marketing program requires a range of creative and technical skills include writing, graphic design, SEO, social media automation, email campaign management, and web analytics. Acknowledge where you (or your staff) are lacking skills and hire professionals to fill those gaps. Look for people with experience in your industry and be prepared to make an investment without immediate payback. Remember, content marketing is a long game with ROI increasing steadily over time. Whether you take a DIY approach to content marketing or hire it out entirely, you should always be at least somewhat involved in your own content creation. After all, no one knows your business better than you. Figure out the why. Write down your reasons for launching a content marketing program and your goals for the coming year and what metrics you’ll use to measure success. Define your target market. Before writing anything, create a customer persona and make sure any content you produce addresses that person’s needs. Worried about running out of ideas for blog posts or other content? Keep your ideal file full with these simple techniques. Follow other blogs in your industry. Don’t steal their ideas, but think about how you can give the same topics a new twist. Read trade magazines or attend a tradeshow and write about industry trends. Keep track of the questions your customers ask most often. Your answers can become a series of posts. Set up Google Alerts related to your industry and create a roundup post of the best stories you’ve read on a particular topic. Join industry-related LinkedIn or Facebook groups and ask for topic suggestions for your blog. Start typing an industry word or phrase into the Google search bar and see what it suggests as popular topics. There’s always plenty of hype around the latest and greatest social media channel, but is Snapchat really the smartest marketing tactic for your B2B? Probably not. The truth is, email—nearly a dinosaur by modern tech standards—offers a far greater return on investment than any social media outlet. An email campaign is six times more likely to generate a click-through than a tweet. A message is five times more likely to be seen via email than on Facebook. For every $1 spent, email marketing generates about $40. Who do you want to read your emails? Who needs your service? Who’s your ideal customer? Knowing as much as possible about your target market will help you craft messaging for their specific goals and challenges. Group your customer list by job title or industry. This allows you to target customers based on their specific needs rather than sending a blanket email. After all, the CEO of a Fortune 500 company has very different concerns than a solopreneur, and your messaging should be tailored to each. Customizing your campaigns keeps them from being dismissed as bland or irrelevant. Before sending your first email, think about your goals. Are you hoping to get referrals? Turn prospects into customers? Keep existing clients happy? Knowing the reason behind your campaign will guide everything from the all-important subject line to the meat of the message. Whatever your mission, keep in mind that no one is as interested in your company or service as you are. Instead of selling, serve as an expert voice who helps readers as they move through the buying process. The most profitable email campaigns include different emails at each stage of this process. Share content shows off your understanding of their problem (ie, trend stories). Once you have their attention, offer facts and figures to support your solution (ie, infographics or checklists). Now that they realize they need help, build their trust in your brand (ie, how-to guides or e-books). They’re ready to invest, but need convincing that you’re the best choice (ie, case studies and testimonials). They’ve signed on the dotted line, but need ongoing support to remain loyal (ie, fresh and relevant content). The goal of email marketing is to entice readers to take action. Typically, you’ll ask them to click a link that takes them to a targeted page on your website. This is called a landing page, and it’s designed to prompt the visitor to take a specific action tied to an objective within the sales funnel. It’s important to spend as much time on your landing page as you do on your email message. The page should be easy to read with highly targeted messaging, and simple to navigate with a clear call to action. When someone takes the desired action, they should be directed to a thank-you page that offers additional resources and encourages them to share your content with others. If you want to learn more about email marketing, here’s a great guide to help. NEXT STEPS: Ready to get serious about email marketing? Get some helpful hints for how to grow your list by downloading my free checklist.